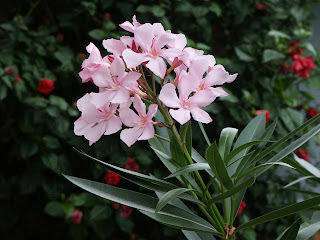 Nerium oleander is an evergreen shrub or small tree in the dogbane family Apocynaceae. It is the only species currently classified in the genus Nerium. It is most commonly known as oleander but has many other names.The ancient city of Volubilis in Morocco took its name from the old Latin name for the flower. 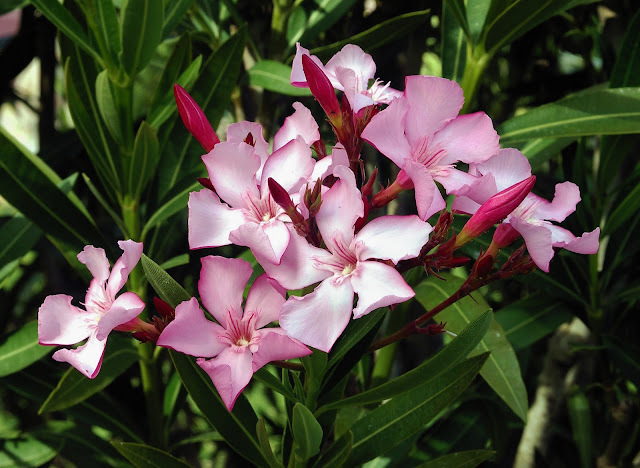 Oleander is one of the most poisonous of commonly grown garden plants, and can be very toxic if ingested in sufficient quantity. It can poison a person who simply eats the honey made by bees that have digested oleander nectar. Reactions to this plant are as follows: Ingestion can cause both gastrointestinal and cardiac effects. The gastrointestinal effects can consist of nausea and vomiting, excess salivation, abdominal pain, diarrhea that may or may not contain blood, and especially in horses, colic.Cardiac reactions consist of irregular heart rate, sometimes characterized by a racing heart at first that then slows to below normal further along in the reaction. The heart may also beat erratically with no sign of a specific rhythm. Extremities may become pale and cold due to poor or irregular circulation. Reactions to poisonings from this plant can also affect the central nervous system. These symptoms can include drowsiness, tremors or shaking of the muscles, seizures, collapse, and even coma that can lead to death. Oleander sap can cause skin irritations, severe eye inflammation and irritation, and allergy reactions characterized by dermatitis. Oleandrin is a toxic cardiac glycoside found in oleander (Nerium oleander). Along with neandrin it is primarily responsible for the toxicity of the sap of oleander.